No aceptaron fotografias, el resultado es que se empezarán actividades de información de impresión 3D en diciembre de 2014. Conferencia para explicar el proyecto en el marco del encuentro internacional de Fablabs realizado en Barcelona. Estand en el Festival generado en el marco del encuentro internacional de Fablabs realizado en Barcelona. Durante el Meeting realizado en Barcelona. Participación en el evento La Noche de la Investigación a nivel Europeo en Barcelona. 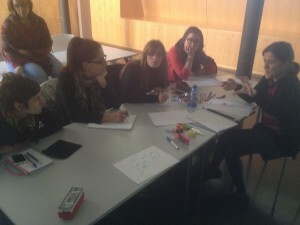 Creación de un espacio permanente para el proyecto para seguir con las actividades de formación, impulsado por las alumnas del curso con la intención de profundizar en los aspectos de la fabricación digital. Make technology a 3D printing industry for job creation, it is the objective of the European project Declic’Industry. In Mons, it is the Right and Duty ASBL, specializing in work integration, which offers these courses. With, the key three opportunities: Assembler 3D printer, designer and developers of 3D objects and agent maintenance and repair of 3D printers. The project requires local activities undertaken by your own organisation. The aim of the project is to include local learners and trainees, staff and local companies. 1.1 Do you feel that you know enough about the project goals in order to organise these events? If not, what could you do to improve this? Yes. We know and feel good with the project goals. But always meet people who also know these topics to learn more. 1.2 Who do you involve when organising these activities? We involve our team, and staff of CEPS. Also, parents of the learners and teachers and principals of the neighbors schools. 1.3 How do you document these activities? We have pictures and flyers. 1.4 Do you communicate your Declicin activities to the outside world, if not, why not? If you do, how do you do this? We are working on sns because we think is a very nice channel to communicate with our target people. We have blog (http://conventagusti.com/maker), twitter (@makerconvent), facebook (http://facebook.com/makerconvent). Also, we move all information in traditional channels like, flyers, publications, posters, and conferences and seminars. The objective of this project is to address the lack of desire from many young learners, especially female, to engage in vocational technical training and to work in production companies. We are interested to hear in what the impact has been so far on learners, staff and your organisation. Please describe in your own words. In the final report you will be asked to evaulate their language skills, ICT skills, Social skills, vocational skills, motivation, self-confidence, knowledge about partner countries and cultures. 2.1 What is the impact so far on pupils, learners/trainees? The impact is high. We have a change from the begin to his point. In reference to learners, they improve skills and knowledge and this is growing in the number of projects developeds linked to the goals of the project. The project is a new point to think, create and learn from a different point of view. 2.2 What is the impact so far on teachers and staff? The impact is high. The teachers depart from a technical, structural and building goal, and change to more dinamic and motivating work together with the learners. training programme – first time to be developped, but we think to repeat the experience. organisation of management – We had to organize differently the activities of the cultural center where the project is located. changes in language teaching policy – only introduce materials in different lenguages. increased cooperation among the staff – yes, we need this for a good work. 2.4 If applicable – can you describe if the partnership has had an impact so far om the local community? Please think of cooperation with other local organisations and other local companies. At this moment the project have the collaboration of the Ajuntament de Barcelona (City Council). And we stay in contact for next projects with the Old Town Residents Association and the Association of elderly neighborhood. The programme of a partner meeting is usually a combination of presentation of local partner, project meetings, visits to local partners and or places of interest and an evening programme. 3.1 What have you found most useful in the partner meetings? We think the most useful of the partner meetings was to meet the reality and conditions of developing the project by the local partner. 3.2 What did you find most interesting in the partner meetings so far? We think important the debate around the goals and find the similar problems and how are solved. 3.3 What is for you the added value of attending a partner meeting? The meetings are very important for communicate, debate and transfer knowledge. 3.4 Do you have any suggestions, ideas for the next partner meeting? All partners involved in the project speak a different language. We now have organised two meetings, one in France and one in Belgium. Conversations were held in French, English, German and Dutch. Talk all languages is complicated. The English was the lingua franca for the meetings, but in some cases we need to explain in French or German some points. 4.2 What is your preferred method of communicating with other partners? (meetings, email, skype, phone call etc). We prefer the meetings, email and if is necessary skype. 4.3 Do you use Springpad to document your activities and findings? If not, can you please explain why? Yes, we think a good platform to exchange knowledge with the partners and information related to the goals of the project. 4.4 Are you well informed of Declic related partner activities? If not, please explain how this could be improved. Yes, we agree and have a clear idea about the different experiences developed for the partners locally. Partners in Delic’In have made a summary of their experience of printing different objects with learners. This is a name tag key chain that can be personalized to any name. The design is created in Open SCAD. This is a free 3D CAD modelling software available for Linux, MS Windows and Mac OS X. Developers worldwide generate coding for designing personalised objects and share their work on online platforms. GitHub is an online platform for sharing code with friends, co-workers, classmates and complete strangers. Over six million people use GitHub to build amazing things together. Wim and Lionel, two members of the timelab community, developed a code for making personalised name tags. This item can be used to make a window garden out of recycled bottles. The design was made by Koen, a timelab community member and instructor of the Prusa build workshop. For the international conference Eurocities – Lionel designed this keychain (left) with the 3 historic towers of Ghent depicted. The design was based on the Eurocities logo (right). For sharing knowledge between the partners we use Springpad. This project has been carried out with the support of the European Community and the Life Long Learning Programme. The views and opinions expressed in the Web site do not necessarily state or reflect those of the European Commission. This project has been carried out with the support of the European Community and the Life Long Learning Programme.